Directions: Turn onto South Fork Rd from Hwy 199 about 1 mile east of Hiouchi. Travel 13.7 miles on South Fork Rd. Turn right on the G-O Rd (Forest Service Road 15). This road is the first paved road to the right one mile past Steven Bridge. Continue on the G-O Rd for 3.5 miles and turn left on FS 15N39. Travel another 2 miles on this gravel road to the trailhead where there are picnic tables, a vault toilet and parking for 10 vehicles. 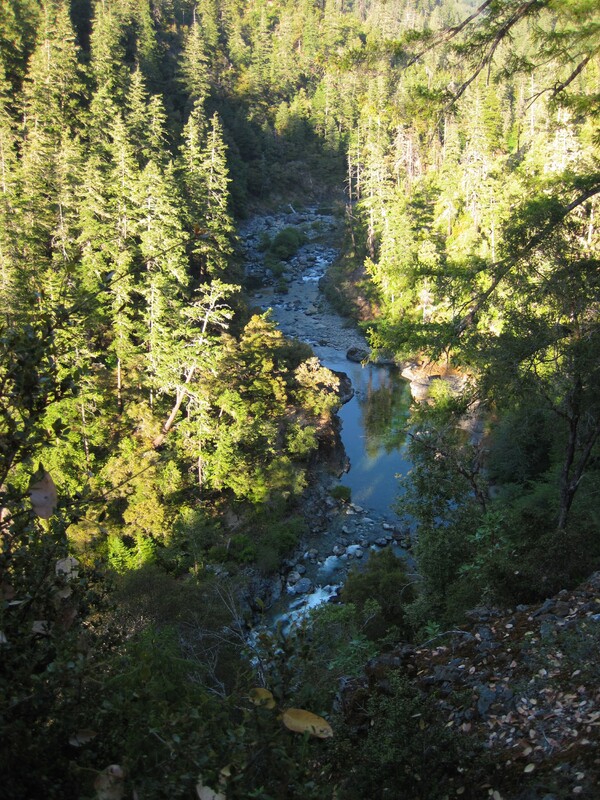 The South Kelsey Trail is one of the most famous trails in the Smith River National Recreation Area. It was designated as a National Recreation Trail in 1979, but it was first used between 1855-1880 as the major transportation link between Crescent City and Fort Jones and other inland mines in the Klamath River region and Yreka. Along with the Old Kelsey Trail, the South Kelsey is a key portion of the Coast to Crest Trail route which connects the Coastal Trail to the Pacific Crest Trail. Portions of the South Kelsey Trail can be traveled as day trips or it can take many days to traverse the entire trail. The present South Kelsey Trail begins between Horse and Buck Creeks and follows the South Fork Smith River for seven miles, affording numerous river accesses for trout fishing. The first few miles of trail are along the steep river banks high above the Smith. A fire in the summer of 1998 burned many acres between Yellowjacket and Buck Creeks. At the confluence of Buck Creek and the South Fork Smith a shelter and clearing offer a superb location to camp with beautiful views into the crystal clear waters of the Smith. Just below the clearing a cascading waterfall fills a rock rimmed pool on Buck Creek before the water filters through a boulder field and joins the Smith. About two miles beyond Buck Creek the trail intersects with Summit Valley Trail. Another clearing at Elkhorn bar offers hikers a level clearing for camping. A mile beyond grassy Elkhorn bar is Eightmile Creek. Travelers will have to ford this creek which is usually only knee deep in summer and about 20 feet wide. 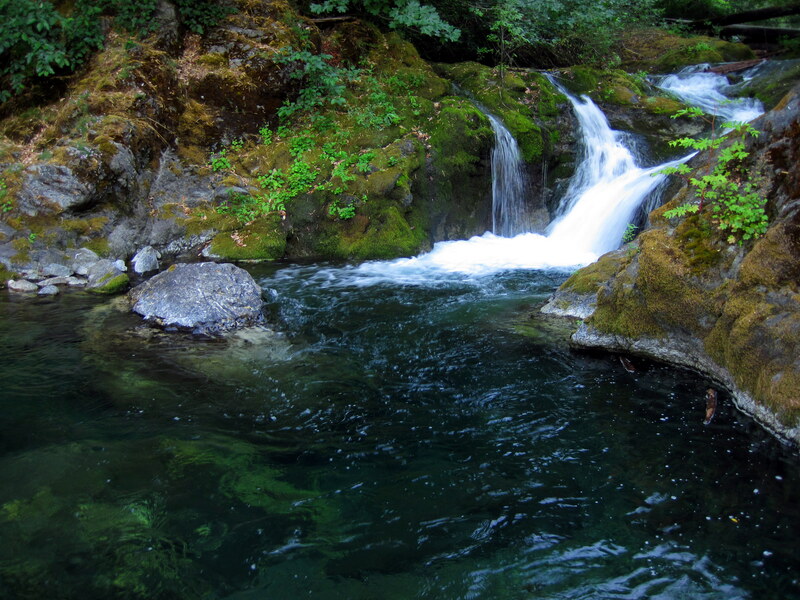 A dark blue swimming hole just upstream from the crossing is plenty deep for a chilling dip on a hot day. The trail descends into drainages and climbs back out of them leading hikers through giant sword ferns and old growth Douglas fir trees. Three and a half miles past Eightmile Creek the trail intersects with Gunbarrel Trail, a 1.3 mile trail from the north. It’s possible to access the South Kelsey Trail from Gunbarrel to avoid the first 7 miles of trail, but that would require missing out on some of the most scenic portions of the South Kelsey. Miles 7-13 ascend to Baldy Peak, reaching 5,775ft. The experienced hikers who reach this former lookout site will be rewarded with awesome views of the Pacific Ocean, the rugged Siskiyou and Marble Mountains, and Mount Shasta. The trail continues another 3.1 miles to Harrington lake and then enters Klamath National Forest where it continues another 12 miles to end at Elbow Springs.